Pacific salmon conservation and the role of the fish in Canada’s economy and First Nations culture. Snow fencing and road maintenance costs along the North’s Dempster Highway. Passive solar heating and the future of energy-efficient housing. 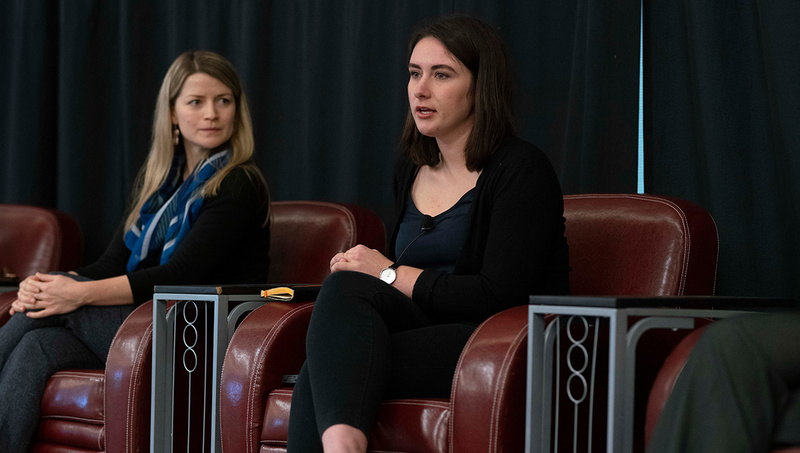 A trio of Carleton University graduate students showcased the range and impact of their research during a panel discussion at the launch of Open Doors, Open Knowledge, a national celebration of federal government support for research organized by Universities Canada. 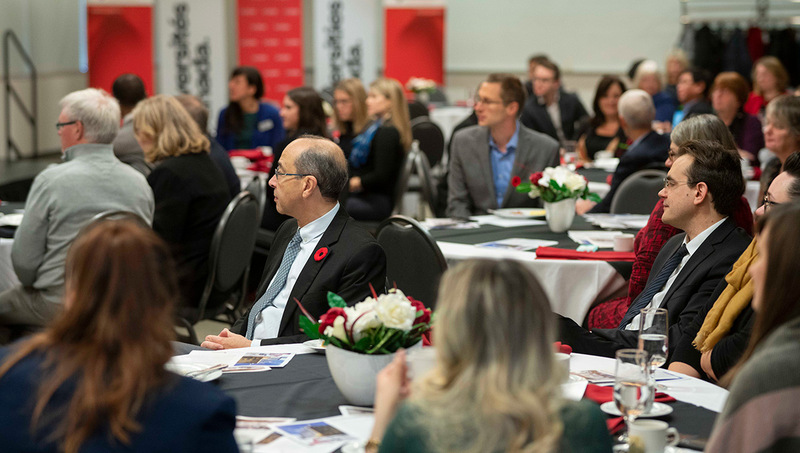 The breakfast gathering at Carleton on Nov. 12, 2018 served as the kickoff for a weeklong series of university open houses across the country, when parliamentarians and other elected officials visit campuses to see first-hand the impact of investments in research. 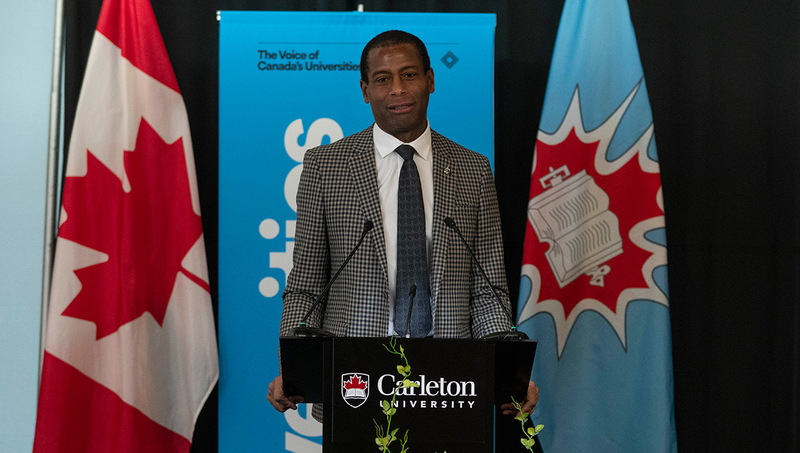 Hull-Aylmer MP Greg Fergus, a Carleton alumnus, attended the event along with newly installed Carleton President Benoit-Antoine Bacon and Pari Johnston, vice-president of policy and public affairs at Universities Canada and also another Carleton graduate. “For me, this is very much a homecoming,” said Fergus, who earned a degree in international relations at Carleton. 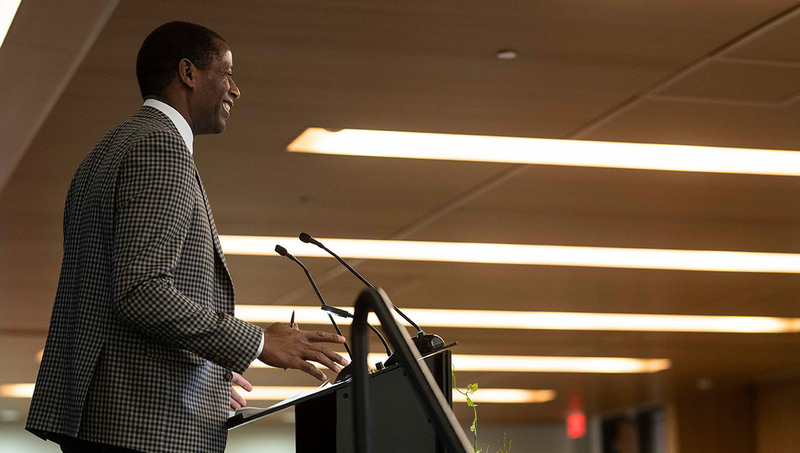 “The educational experience at Carleton, at both the undergraduate and graduate levels, is remarkable. 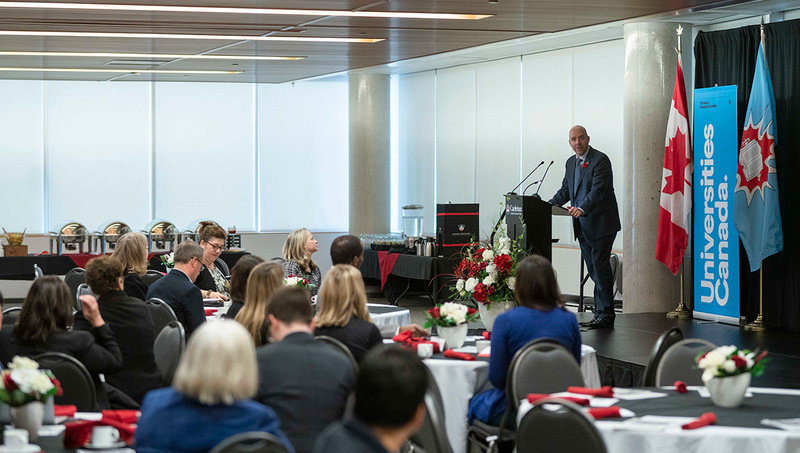 “Today is a great opportunity to come to campus to meet students and researchers — our bright new stars — and see what they’re contributing to Canada and to the world,” he added. “These things are at the cutting-edge of what research is all about. 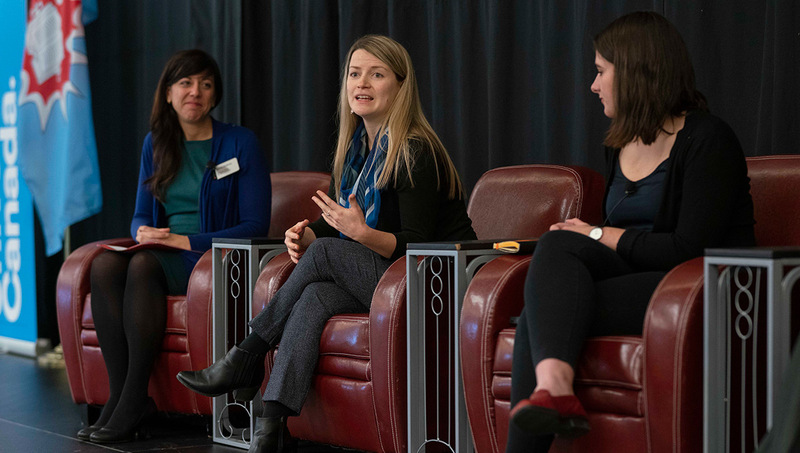 Chemistry Prof. Maria DeRosa — who does groundbreaking research that has applications in areas such as health care and agriculture – she’s also associate dean (Recruitment and Retention) in Carleton’s Faculty of Science — moderated the student panel discussion. “From the north end of campus to the north of this country, we will show you the breadth of what we’re doing,” she said in introductory remarks. “The second I got to university and saw that this was something I could pursue as a career, I jumped at it,” said Andrea Reid, a conservation biologist who felt a strong connection to fish growing up in Prince Edward Island and has embraced her Nisga’a heritage in her PhD research, which blends ecology, physiology and anthropology to explore how Pacific salmon fisheries can become more sustainable. This past summer, Reid travelled throughout British Columbia to talk to First Nations elders about traditional fishing practices. “These are practices that have developed over millennia and we can learn from them,” she said. Geography PhD student Jennifer Humphries’ research is evaluating the effectiveness of snow fencing to improve maintenance along the Dempster Highway, which connects the road network in the Yukon (and southern Canada) to Inuvik and Tuktoyaktuk in the Northwest Territories. 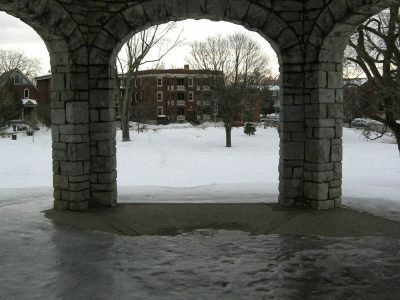 Maintenance costs have been rising rapidly over the last two decades, Humphries said, which is both an economic issue and a safety issue. 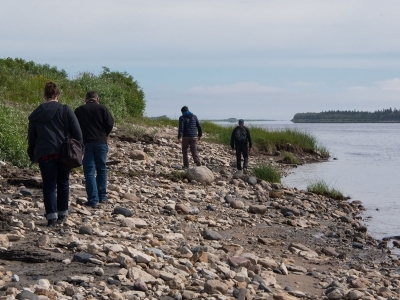 “The Dempster provides important access for communities along the route,” she said, noting that her work is funded by Transport Canada’s Northern Transportation Adaptation Initiative Program, as well as NSERC and the Yukon and NWT governments, both of which are heavily supported by Ottawa. Humphries’ research is evaluating the effectiveness of snow fencing to improve maintenance along the Dempster Highway, which connects the road network in the Yukon (and southern Canada) to Inuvik and Tuktoyaktuk in the Northwest Territories. Sarah Brown, who is working on a PhD in Sustainable Building Energy Systems, does much of her research in the Urbandale Centre for Home Energy Research, a full-scale house-like lab just off Bronson Avenue. 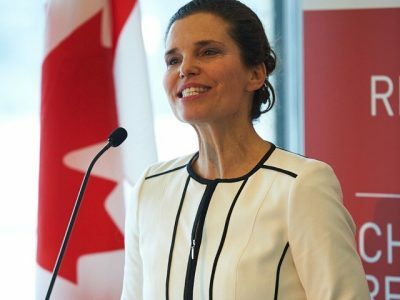 “We want to replace conventional space and water heating with solar,” said Brown, explaining that these two uses account for 81 per cent of household energy consumption in Canada. Passive solar heating could reduce this consumption — which would have tremendous environmental and economic benefits — in a significant way. “I want to implement these changes in my house someday,” said Brown, who has also received funding from NSERC and credits support from the Canada Foundation for Innovation with making the Urbandale Centre a reality. “It’s amazing that we can do research on this things in a lab that’s just like a house. I couldn’t get access to a facility like this anywhere else. “When you work at a university in Canada, when you study at a university in Canada, you’re deeply aware of just how important federal funding is for research and discovery,” Bacon said in his opening remarks. “We’re living in an era of unprecedented geopolitical change and changes to the labour market. Our ability to adapt is the key to Canada’ success. 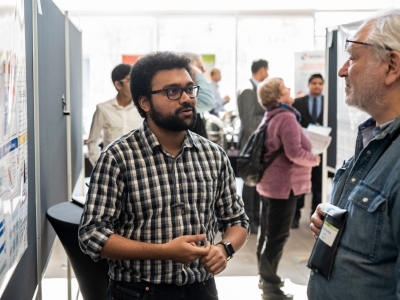 Bacon cited Carleton’s energy efficient Northern Nomad tiny house — which has been towed to a new location outside Richcraft Hall and was open for attendees to visit after the breakfast — as one example of the university’s research excellence. He also mentioned the new ARISE building, which is being built with support from the Government of Canada’s Post-Secondary Institutions Strategic Investment Fund as a future home for exciting research in clean technology, health technology and information and communication technology that will bring together students, professors and industry partners to consider some of today’s most pressing challenges.